Kent Excel+ is Under the Counter RO Water Purifiers, Distinctive space saving design, appropriate for under the counter installation in modern kitchens. 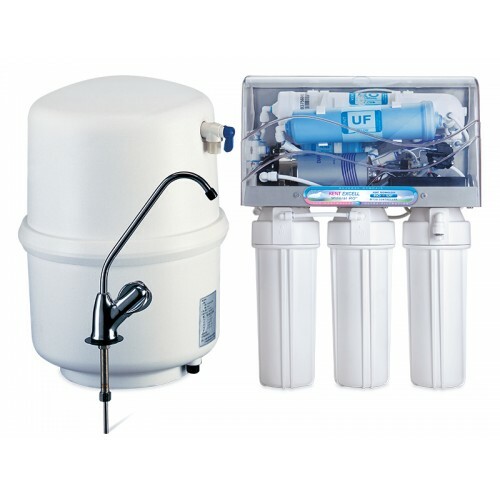 Under the counter advanced RO water purifier with KENT's patented Mineral ROTM Technology and an inbuilt TDS controller. Best suited for Indian kitchens and suitable for purification of brackish/tap water/municipal corporation water supply. Smart and Elegant Design, KENT Excell+ has a versatile design, ideal for modern kitchens. It can be installed under-the-counter or placed beneath the kitchen sink, saving a lot of counter space. It is also suitable for attachment with water coolers and for refrigerators with water dispenser. KENT Excell+ has 7 litres of purified water storage capacity with a hydrostatic storage tank. This tank facilitates pressurised supply of purified water even in the absence of running water and electricity. Double purification of RO + UV/UF removes even dissolved impurities such as chemicals, bacteria, viruses and salts, making the water 100% pure. KENT Excell Plus have World's Top Quality Certifications World's Top Quality Certifications kent RO purifier is tested and certified for its performance and quality by world's renowned laboratories, such as the WQA (USA & India), NSF (USA) and ISI (India). These achievements guarantee that KENT not only gives the most purified water but is also trusted by millions.